Give a Minute is a new kind of public dialogue. It only takes a minute to think about improving your city, but your ideas can make a world of difference. "Give a Minute" is an opportunity for you to think out loud; address old problems with fresh thinking; and to enter into dialogue with change-making community leaders. Soon, you’ll also be able to link up with others who have similar ideas and work on making your city an even better place. Very cool site, in terms of design and presentation. The submissions appear as Post-It notes. 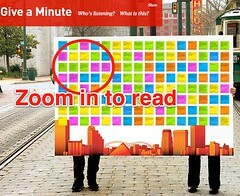 To view them, you use the Zoom-in feature (at the top left of the website). The individual notes can be shared via Facebook. I didn't try to submit a suggestion, so I'm not sure if there's any filtering or authentication (by IP address) on what appears on the page. BUT IS IT REALLY CROWDSOURCING? 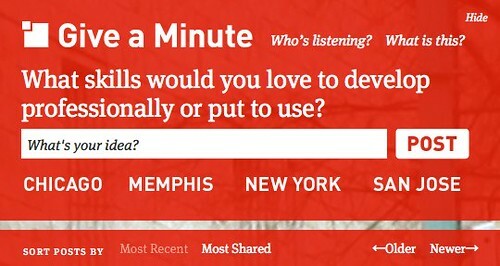 For all its coolness, the Give A Minute site functions more like a feedback portal rather than a real crowdsourcing site as suggested by the Co.Design article headline. 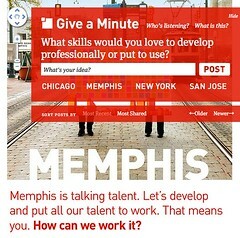 Though in fairness, the Give A Minute site itself didn't suggest that it was crowdsourcing in any way. I understand Crowdsourcing to be more than just "ideas from the crowd". There has to be some activity or actions from participants too. Merely soliciting ideas and views doesn't seem like crowdsourcing to me. The Singapore government's equivalent of Give A Minute would be the REACH portal, and probably the eCitizen portal (i.e. the Feedback page, where submitters don't have to worry about which government agency to direct their views). As both a library employee (we receive loads of suggestions) and also a private citizen who has submitted feedback to private companies and government-related organisations, I think ideas are cheap. The devil is in the implementation. I'm not demeaning the ideas from customers (or myself). It's good when the citizenry/ public is increasingly forthcoming with views and suggestions, for the opposite would be apathy. Social media is increasingly the tool of choice for engaging the citizenry. But it's become so easy to give ideas and suggestions that the concept of engagement has to be more than that. The article made me wonder how government agencies could adopt crowdsourcing as a means of engagement. Or more important, what would make it work? Meantime, if you happen to stumble onto this post, feel free to leave your comments. Nice post on something which I have been thinking about lately too. As you've shared, ideas are fast and plentiful, especially if they're just a couple of sentences pulled together. Without the right background knowledge and context, crowdsourcing becomes just another buzzword in the 2.0 lexicon - nice sounding but devoid of real meaning. The real value probably comes from a closer working relationship between the public, private and people sectors working together to solve issues or problems from a more fundamental level. My name is Zee and I'm graduating from my diploma in 2 months time. I stumbled upon your blog while i was trying to find out how much a librarian earn in Singapore. :P I'm actually very much interested in pursuing my career as a librarian. Hi Zee, questions on salary and benefits are best answered by the employer. Their responses will vary. My suggestion is that you think of what you can do for the profession rather than salary or benefits first. Good luck with your job hunt.